The calendar may have turned to 2016, but temperatures are picking up where 2015 left off. January was record warm, according to data released this week by NASA. You may recall that last year was the hottest on record for the globe. And by NASA’s accounting, it ended with a bang. This past December was the warmest December on record and the most abnormally warm month on record, too. 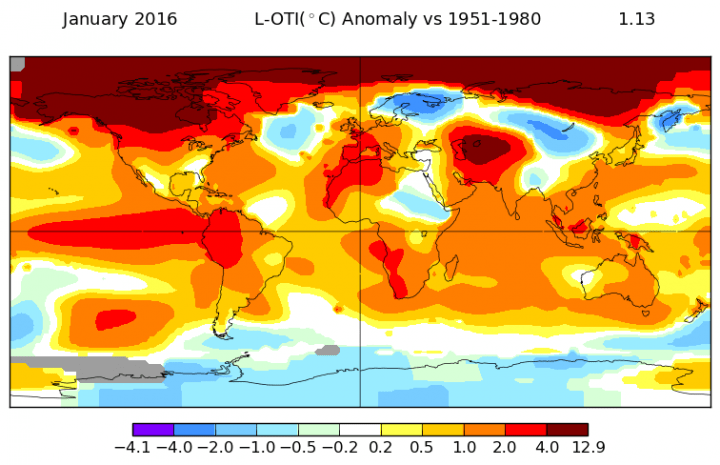 This January was the warmest January on record by a large margin while also claiming the title of most anomalously warm month in 135 years of record keeping. The month was 1.13°C — or just a smidge more than 2°F — above normal. That tops December’s record of being 1.11°C — or just a smidge below 2°F — above average. It marks the fourth month in a row where the globe has been more than 1°C (1.8°F) above normal. Incidentally, those are the only four months where the globe has topped that mark since record keeping began. Large swaths of the globe were painted red by warmth to the point where it’s easier to talk about where the heat wasn’t (that would be Antarctica, Scandinavia, East Africa and a few parts of Russia for the record). The telltale signal of El Niño’s heat in the Pacific continues to be notable, but it’s the Arctic that truly stands out as the most abnormally warm place on the planet. According to NASA, temperatures in some parts of the Arctic averaged up to 23°F above normal for the month. No, that’s not missing a decimal point. A group this week has announced that the thousands of cases of microcephaly reported this year aren’t down to the Zika virus, but are instead due to pesticides. The report, compiled by an Argentinian organisation called Physicians in the Crop-Sprayed Villages, highlights the fact that some areas hit hard by the epidemic have not reported any cases of microcephaly. For instance, more than 5,000 pregnant women have been infected in Colombia, but there has been an apparent absence of this birth defect, which causes babies to be born with abnormally small heads. Yet in Brazil, there have been more than 460 cases confirmed since the outbreak came under investigation last year, and more than 3,800 suspected cases. The link between microcephaly and Zika has yet to be confirmed, but is strongly suspected by health professionals. The report however proposes an alternative explanation: a larvicide called pyriproxyfen, which has been added to drinking water supplies in some regions of Brazil since 2014 with the aim of reducing mosquito numbers. And of course, just to make the story sound more convincing, the document points out that pyriproxyfen is produced by a subsidiary of Monsanto, Sumimoto Chemical. However, Monsanto has been quick to point out to Tech Times that it does not own the company. Some 700,000 declassified Central Intelligence Agency files, held on public yet largely inaccessible CIA computers, are just waiting for someone to come along and print them. One Kickstarter project is on the verge of doing exactly that. Michael Best, who has used the online moniker “National Security Geek,”launched the project to raise $10,000, and he’s already near his goal thanks to hundreds of backers. They all want to have a hand in disseminating the unreleased CIA files, numbering about 10 million pages, to the general public. Even though the documents have been declassified, they remain locked up in four computers at the National Archives and Records Administration in College Park, Maryland. Known as CREST, the CIA Records Search Tool allows anyone to search the documents, but only if they wish to make the trip there. Even then the only way to share any findings is to print, scan, and upload, which so far has only happened with about 1 million out of the total 11 million pages in the archive. Eventually, the newly unearthed volumes would be sent to The New York Times and Wikileaks, while the physical printouts will be donated to a library, archive, or university, according to the Kickstarter page.